Growing up in Mississippi, Kid Curry has always loved the old West and the cowboy life. Dressed in western clothes, hat and boots all his life and as a kid his favorite show was Alias Smith and Jones (Hannibal Heyes and Kid Curry, where his alias comes from) he would put on his holster and cap gun and when the Kid would get in a shootout he would stand and try to beat him. 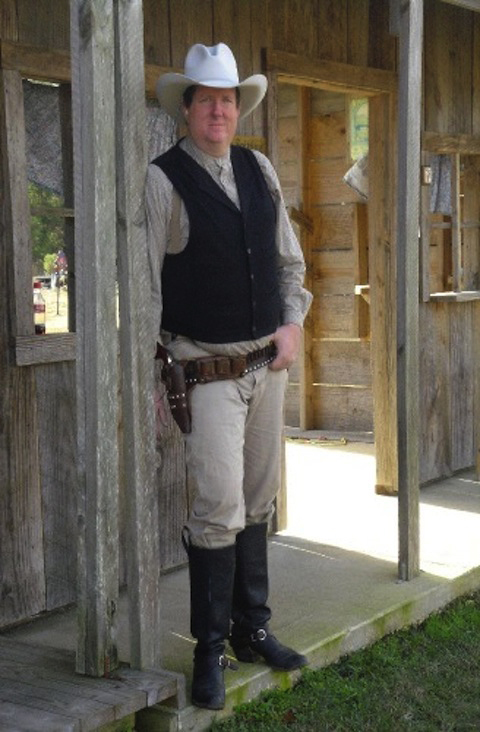 In 1994 he found the World Fast Draw Association (WFDA) and joined immediately. Talked with Bob Graham, purchased a gun from him and found the closest club to him which was in Kingston, TN. Drove there to compete in a Monday night practice session which was an 8-hour drive went back a few months later and competed in 2 main matches one Saturday in Kingston, TN, and one Sunday in Dayton, TN. Kid Curry has made some great friends from that match and many since then traveling all over the country. In 2014 he joined the Cowboy Fast Draw Association (CFDA) and started a Club in Amarillo, TX in 2016, Hosted the 2017 Southern Territorial in Amarillo and in 2018 and 2019 will have the Southern Territorial and the US Nationals.